Audi Japan (アウディ) has launched a television commercial featuring both the Audi Bespoke Mountian Bike and the Q5 mid-size luxury 4WD. Using the tag line, “Agility that conquers the city” we’re introduced to a fearless exploration of parts of the city usually explored on a mountain bike. We’re taken on a POV (Point of View) bicycle journey through a park, on the street, a narrow alleys, across a public square, and down the stairs. It’s only as we cross a bridge that we discover the vehicle below the vehicle and pointed to the web site, www.audi.co.jp/q5. 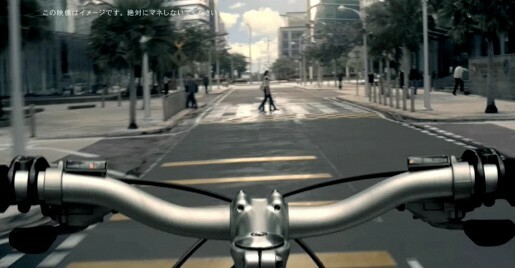 The Audi Q5 Bicycle ad was developed at Ogilvy and Mather Tokyo by executive creative director Mark Collis, art director/copywriter Alex Noble, copywriters Takamori Kadoi and Motonori Sugiyama, strategic planner David Vroland, agency producer San Takashima, with agency support by Atsu Keino. Filming in Kuala Lumpur was shot by director Anthony Redman via Passion Productions with executive producer Jamie Popham. Original music is by SongZu.